What You are about to get to know from this article is a Secret Magical Item that some Taoist Sorcerers / Taoist Masters used to keep to fight off black magic, expell evil spirits and to have a direct connection with the Taoist Deities to be imparted with spiritual knowledge directly. 1st of all, let's understand why a Taoist Master / Taoist Sorcerer secretly use / keep a Taoist Bagua Jade (or any crystals or gems with a 'Pre-Heaven' Bagua Symbol). Whether You have totally no clue how Taoist Masters / Taoist Sorcerers go on their spiritual work on exorcism, protecting ownself from black magic attack, expelling spirits on haunted premises, You will get to know (or already know) that there is a very powerful weapon used by Taoist Masters, which is the Taoist Black Command Flag (The most basic one is usually just a 'Pre-Heaven' Bagua Symbol on a black cloth). To a layman, it is just a black cloth most likely for display / decoration purpose, but , lo and behold, the holding of the black command flag on Your hand is actually commanding heavenly warrior - generals leading hundred over thousands of heavenly soldiers ready for spiritual battles. You will commonly see Taoist Black Command Flag on a wooden pole flying high, during Taoist Spirit Medium Worships. Now, the problem is, You wouldn't be holding a Taoist Black Command Flag all day long, waiting for spiritual battle. Therefore, Taoist Bagua Jade is born to be portable and secretly kept to be used anytime when in need. If You have watched Lam Ching Ying's Ghosts / Vampire Movies before, that part which he used a Jade of Taoist Yin Yang Symbol to fight off the Black Magic battle from the Japanese Black Magician, You will understand the meaning. When I (Taoist Spiritual Master) chose Jades (or any Spiritual Items) for spiritual activation for the purpose of personal protection and spiritual work, there must always have 'Bagua' Symbol on them, and it must be 'Pre-Heaven' Bagua. With a proper 'Pre-Heaven' Bagua symbol on any objects, by itself alone, it already has the most basic potential spiritual power to work it's magic - Just like a battery before it is charged up. When ghosts / evil spirits see it, it will be stunned and behave properly. It is as if when someone heard of the national enthem, he / she will stay put and stand still to the national enthem. Once the Bagua Item is spiritually charge up, the magical power of it becomes deadly. There are many people, who are not learned in Chinese Methaphysics, can't differentiate between 'Pre-Heaven' Bagua and 'Post-Heaven' Bagua. Many people still think there is only one type of Bagua. Some folks think the 3 strokes on the 8 sides of Bagua can anyhow draw base on personal liking. If You were to choose Your own Bagua Spiritual Item from any 'Feng Shui' Shops, make sure it is a proper strokes of 'Pre-Heaven' Bagua on all eight sides. If You were to engaged a Carving Master to carve 'Pre-Heaven' Bagua on a Jade / Stone/ Crystals etc for You, make sure the person know what You mean. Only proper 'Pre-Heaven' Bagua can be used to have a direct link with Deities, use for expelling ghosts, exorcism, fight against black magic. 'Post-Heaven' Bagua is used in Feng Shui dealing with Humans life on earth, divination (prediction of upcoming events), military strategy etc. The video shown is the spiritual activation ritual of Taoist Bagua Jades (for use in expelling ghosts and destroying black magic) for clients who have ordered them. Notice the 1st step is the spiritual cleansing of the 'filthy' & 'impure' energy of the Bagua Jade (Before it becomes a Powerful Bagua Jade for spiritual work) must be done, then follow up with the 'dotting' (activating) ritual. After the 'dotting' ritual, the Taoist Bagua Jades are then continued to be chanted with Secret Bagua Incantations (not shown on the video) for 108 times per day for 49 days, to have a full completion of activation. Noticed on the picture and video, 2 dragons were shown embracing the Bagua. Spiritual activation (Yes.. there are spiritual activation process for dragon items) of the heavenly dragons (Meaning : calling upon the spiritual energy of heavenly dragons to enter the Jade) are included to boost up the overall magical power of the Bagua Jades. The usage of these types of (spiritually activated) Taoist Bagua Jades are not for normal Feng Shui use (even though it can be used as such) because of the fee I (Taoist Sorcery Master) charge is extremely expensive. 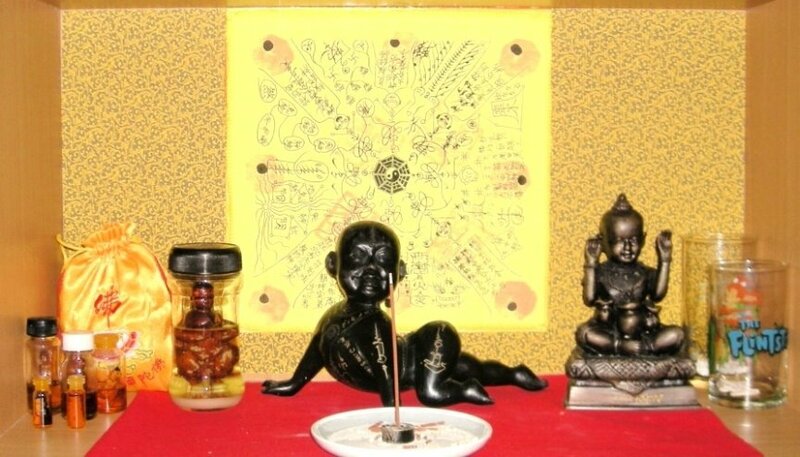 It is mainly used by Taoist Masters / Taoist Sorcerers to expell ghosts , destroy black magic, block black magic attacks and help people to wake up / recover from spirit possession / black magic attack. Folks who just want to wear a Jade (or crystals / stones), or 'Bagua' Jade for fun, or for 'beauty' sake, can get cheap ones (without going through spiritual activation process) at any Jade / Crystal Shops. Some 'Feng Shui' Masters may help to do simple 'blessing' (mumbling some simple Taoist verses) on the Jades / Crystals for just a small fee. Important! 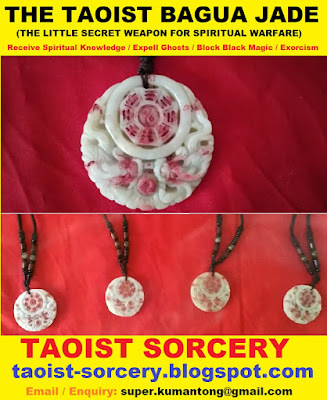 : Folks who are following the Taoist Spiritual Path / Taoist Magic Path can wear this type of Taoist Bagua Jades to have a close connection with the Taoist Deities to be imparted with spiritual knowledge directly from the Taoist Deities. How to use the Taoist Bagua Jade? 1) You can wear the Spiritual Bagua Jade when You are doing prayer or meditation to have personal connection with the Heavenly Deities of the Tao. - To receive spiritual knowledge from the heavenly deities. 2) When a person is suspected to be possessed by ghost , or behaving weird due to black magic attack, place the Bagua Jade onto his / her forhead (or place the Bagua Jade (with the necklace) around the victim's neck) , the ghost / evil spirits shall be expelled. 3) Wearing the Taoist Bagua Jade or carrying it, no ghosts /evil spirits are able to harm You, no black magic can affect You. Now You know why Taoist Masters / Taoist Sorcerers have some form of secret personal spirtual protection like the Bagua Jade (or a Taoist Protection Talisman). Special Note: Folks who might not be able to afford, or not interested to pay for the high fee for this type of Taoist Bagua Jades, but yet still want some form of very powerful spiritual protection, may decide to own the 'Protection All In One' Talisman instead.